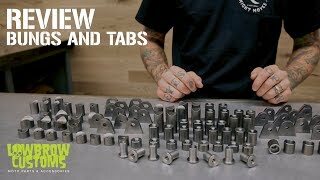 This Pro-Builder's Steel Bung and Tab Assortment includes 120 pieces. The amount of time this can save you fabricating each of the bungs or mounts you need on a motorcycle is immense. The ability to grab what you need off your shelf and keep working rules, and this assortment saves you 30% compared to buying these individually. See the list of what is included below. Made in Ohio, USA. Great quality and assortment, timely shipping. Great product. Love it. As soon as I see the box I knew it's gonna be ok, well packed, inside all you need to get all your ideas finnaly attached to the bike lol... will shop again. Thx guys.